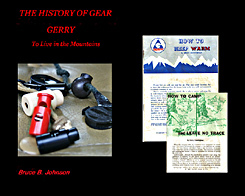 BOOK ABOUT GERRY Mountain Sports: "GERRY, To Live in the Mountains," 80 pgs. ISBN 978-1-4276-3231-9. Offered in softbound or hardbound; 8x10 format lavishly illustrated with high-quality color images (picture of cover below). Please visit Blurb Books, my Publisher's website. Here, you can view a free PDF preview of the first 15 pages, and then order the book if you desire....The GERRY book is also available for $15 as an inexpensive PDF download, directly from me (oldgear@oregonphotos.com)....... Autographed hardback or softback books: please contact me at oldgear@oregonphotos.com to purchase an autographed copy. Costs will be 10-25% higher due to my having to ship the book twice, once to myself and once to you.... This book was written with direct and very generous assistance from founder Mr. Gerry Cunningham and his daughter Penny. Click here to go to a Book Review, in which Mr. Cunningham himself gives my book about his company a glowing thumbs-up. Click here for my discussion of my pricing and quality. Click here to read my Biography as a writer.... Click on the book cover to preview/purchase the GERRY book! Immediately after World War II, Colorado was a ripe market for a business targeted to mountaineers and skiers. Gerry Cunningham was another of the originators who lived in or around Boulder. He is clearly one of the very most important inventors among the early Gear innovators; in so many ways, a Pioneer of major stature across a wide variety of types of gear, from packs to tents, to pitons, to acessories such as cordlocks and food squeeze tubes. Gerry for many years was quite a mountaineer in his own right. 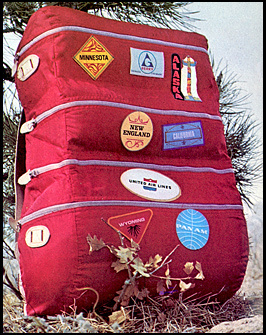 He was friends with many of the big name climbers of the 50s and 60s, and supplied the likes of Barry Bishop, Lute Jerstad, Willie Unsoeld, Tom Hornbein, Pete Schoening, Bob Craig, Dee Molenaar, Art Gilkey, Charlie Houston, and Bob Bates with the GERRY Himalayan Tent and other GERRY gear (click here to skip to Page Two, and more about Gerry and his climbing connections). The company officially began right after Mr. Cunningham mustered out of the Army in mid-1945, and for a brief time was based in Upper New York State. By 1946 Cunningham had moved his new business and his wife to Colorado,opening his business there at just about the same time as Roy and Alice Holubar began their outdoor gear business in Boulder..... In those very early post-War years, Gerry's equipment carried a woven label with the original "Gerry" logo, and the words "Gerry Mountaineering Equipment Company," and if you find gear with that original label, much of it was sewn by Mr. Cunningham himself, and is very collectible. 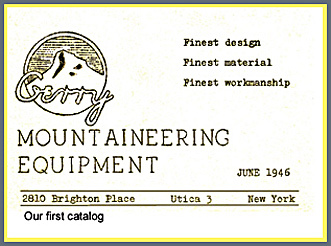 Note: the original logo is shown in the image of the 1946 catalog- it was a mountain peak with what looks like a handwritten "Gerry" across the bottom of the peak (the logo in the other images seen on this page are the more stylized version that became the standard for later years). Regarding the Holubars, Gerry told me, " I was never an employee of Holubar. The only contact I had with him (Roy) was to sell him surplus army gear which I had access to as an ex-GI and he didn't. I sold him sleeping bags and ice axes as I remember." G. A. Cunningham. Regarding Frostline Kits, Gerry remembered fondly the early days circa 1960, "....I sold kits to make gear in 1955, but when Dale and Julie Johnson joined me, we couldn't keep up with the orders for finished products, so discontinued the kits. Dale and Julie of course went on later to make a roaring success of themselves with Frostline." Please Note: All Material below, and in all my "History of Gear" webpages, is copyrighted, and no usage of my material is permitted unless explicit permission is granted by me, Bruce B. Johnson, owner of OregonPhotos.com. Some of the material below is derived from interviews and/or correspondence with Gerry Cunningham, his daughter Penny, Meg Hansson and her daughters, and also from some ex-Holubar employees, as well as my own research..... Editors: Please contact me if you have interest in publishing (oldgear@oregonphotos.com)....Others: if you were involved with one of the old-line, vintage gear companies and have a story to tell in these pages, please contact me soon. 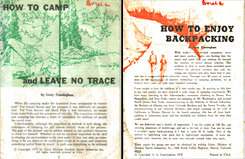 GERRY'S Famous Booklet Series: Gerry Cunningham wrote a series of at least six free booklets that are now collectibles. He also travelled around the Country as an educator and lecturer about saving the Environment many years before it became a popular thing to do. The booklets were sized at 5x7 inches, except for "Wilderness Traveler," which is slightly larger. "How to Keep Warm," 1967. 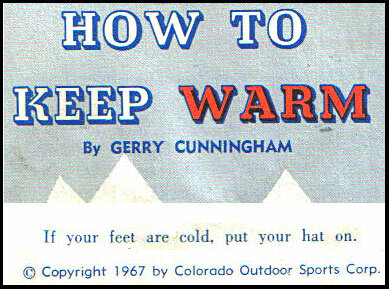 "If your feet are cold, put your hat on" was the opening sentence of the small but highly influential booklet. For decades, that proverbial sentence has been drilled into the minds of everyone who takes an outdoor course on winter survival. The 15 page booklet is crammed with other similarly timeless wisdom.. I recommend it highly. (Note: all images on this page are custom creations of OregonPhotos.com and are copyrighted; the original booklet of course continues to be under its own copyright).... The picture below shows Mr. Cunningham in the 1970 GERRY catalog. It's from a page where he discusses in depth "How to Keep Warm." He's probably in his late-forties at the time. Many decades after Muir, Cunningham's "No Trace" ethic had distinct parallels to Yvon Chouinard's famous 1972 "Clean Climbing" ethic*, as published in Chouinard's classic 1972 catalog. Gerry told me that he had written the booklet on/for the first EARTH DAY, which was April of 1970...The booklet was distributed free of charge by the thousands and was published several times; the date on my copy of GERRY's "No Trace" booklet is 1972. *Notes: actually, many sources impute clean climbing in the USA to Royal Robbins. Those sources say that in about 1966-67 Royal brought back back the first climbing nuts from Joe Brown's shop in Great Britian, which helped lead to Doug Robinson's seminal article "The Whole Natural Art of Protection," as written for his friend Chouinard's 1972 catalog. "How to Enjoy Backpacking," 15 pages, eeriely foreshadows the modern backpacking revolution centering around "ultralight" gear, and the slim booklet's wisdom still rings true despite the advent of a number of high-tech materials and advanced hard goods since the time it was written. Shown is my 1972 copy; I also own a mint 1966 version of this booklet, which may have been the very first of Mr. Cunningham's booklet series. Click for a picture of a modern ultralite gear afficianado at rest in her camp. Also not pictured: "Light Weight Camping Equipment and How To Make It," by Gerry Cunningham and (Meg) Margaret Hansson. This is a true book, a bit over 100 pages, first published in 1959. This is an interesting and important story. It is covered more fully, with text and pictures, in the book about GERRY that I wrote, see page bottom for link. Gerry Cunningham invented and patented the "Drawstring Clamp" sometime in those very early years (the 1950s is my estimate). Later to become known as the "Cordlock," this small device replaces knots and has become omni-present in today's society, even reaching into areas having nothing to do with backpacking or climbing! Gerry and his wife Ann also experimented with the first modern baby carriers, and patented their original design in 1963 as their "Gerry Kiddie Carrier." Innovations included the use of lightweight aluminum for its "S" curved frame, and lightweight nylons for the material. It was to sell for some forty years! Many of us as infants and toddlers spent hours in the out-of-doors in a Gerry Kiddie Carrier, and the close parent-to-child contact these carriers allowed led to some life-long pleasant associations to the outdoor world.........The third GERRY innovation I will mention here is the GERRY squeeze tube, invented circa 1955 to support Gerry's "Go Light, Leave No Trace" backpacking philosophy.... Here's how these tubes worked: you would open up the bottom of the GERRY plastic tube, which resembled a toothpaste tube. Then you would insert the gloopy, messy food of your choice and re-seal the tube, which dispensed out the top, just like toothpaste! In this way, you automatically left behind the glass jar, reducing weight in your pack, and never being tempted to toss the used-up jar out into the forest! My "tube" favorites were peanut butter and jelly, but I've seen creative cooks squeezing an amazing variety of stuff out of these tubes. Once on a winter trip in the Tetons, I witnessed frozen orange juice being oozed out onto some kind of chicken dish!.... I believe these tubes are now in common circulation as an outdoor product, no longer branded "GERRY." 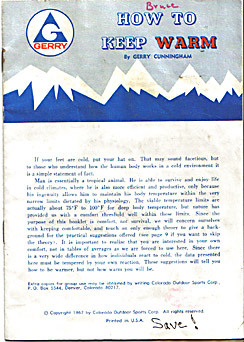 GERRY PACKS: no discussion of the innovations of Gerry Cunningham can be complete without pointing out that Mr. Cunningham began with a passion for improving packs as far back as 1938. Packs were his very first dream. The "teardrop" pack prototype he designed was lost in a canoeing accident and then he got sent off to fight on the Italian front in WW II, but he never lost the passion for designing and building better packs, for which he holds several patents. His concepts and materials continued to evolve right up to the time he left the company in the late 1960s. 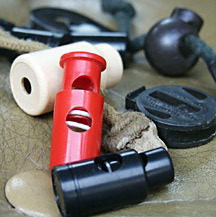 At that time, the latest expression of his concepts about packs were found in the company's line of "CWD" packs (Controlled Weight Distribution). The concept was even applied to creating a line of CWD packs for horse-packing!..Gerry packs were designed for the outdoorsman or woman, they were made to be durable and light weight so that they would hold up to the rugged conditions and trips that the users would be bringing them on. These trips, more often than not were away from the sun coated beaches and beautiful hotels in Miami. The weather could be beautiful or harsh depending on the day you were out. The winds could be very hard and cold like in Chicago but you did not have the ability to dip into warm Chicago hotels when you were out in the mountains, you had to be able to stay warm and protected. Gerry's gear did just that for you! Down Insulated Clothing: GERRY-branded ski apparel and down garments rose to prominence at the 1964 Winter Olympics, where GERRY insulated parkas were worn by the Olympic Committee members and caught the buying public's eye...This moved GERRY firmly into the "skiwear" category and further away from its mountaineering gear roots...... The ski apparel and down garment type of GERRY product is still commonly available at such places as eBay. Whether or not they are "really" GERRY is unclear (see below). Skip to GERRY, PAGE TWO, wherein Meg Hansson and the GERRY Kiddie Pack, adapters for the GERRY Mini-Stove and other topics are discussed! Gerry Cunningham himself was 84 years old when I first contacted him in 2006. He'd been living in warmer West Coast climates in the mountains of Arizona for many years... He'd retired from the company decades ago (1970).... He noted to me that the brand name "GERRY" is still in use, but he doesn't know details and doesn't follow such matters anymore. He states that his last substantial contact with his old company was in 1991. At that time, he was honored among the select group of Pioneers of the Industry at the annual meeting of the Outdoor Retailers Association in Reno... Here he met Paul Jamison, then President of GERRY, which was then based in Seattle.... Gerry remembers that he and his wife Ann were honored and wined and dined by Mr. Jamison... But in subsequent years there were new corporate owners (see below)....(Source: emails and written material from Gerry Cunningham and his daughter Penny Cunningham). Sad news from 2010 is that Gerald Arthur Cunningham, born 2/17/1922, passed away at his home in southern Arizona on May 15, 2010. Anne, His wife and life-long companion, had passed away about a year before. Their ashes were scattered onto their original home in the mountains west of Boulder (Ward, Colorado)....We have lost one of America's greatest gear innovators. He was a man who had a lifelong message for us all: "Travel light and leave no trace." In my own experiences with him, he was unstintingly kind and helpful. He was one of the true Greats of our Age. the label on the left shows that "GERRY" was founded in 1946...... Mr. Cunningham's first two real stores were in Boulder, and at some point, probably in the Mid-Sixties, he opened his main store in Denver. Notes: you can find "GERRY" labels on recently made outdoor clothing; those will state that the Company's location is now in Seattle (see small image to left)..... GERRY (the company) was long ago absorbed by a big corporation; eg., the 1972 booklets state the company's circa 1972 ownership in this way on their back covers: "Gerry Division of Outdoor Sports Industries Inc., Denver, Colo." A different version comes from 1966 literature: "Colorado Outdoor Sports Co., Division of Outdoor Sports Industries, Inc." (as shown on the1966 booklet "How to Enjoy Backpacking."). I have also seen a GERRY garment label with text about "Outdoor Products Company.".... Much more recently, one can trace the GERRY brand to a big corporation named Amerex-- here's a quote from their website: "New York, NY - (September 4, 2002) - Amerex Group Inc. one of the largest privately-held U.S.-based manufacturers of quality outerwear and The National Standard Race (NASTAR), the largest public grassroots recreational ski race program, today announced that Amerex's proprietary brand Gerry&REG; will become the national sponsor of the "Jeep King Of The Mountain NASTAR" 2003-04 race season...." The new motto I saw there on the company website was "GERRY, Bold in the Cold." Their site has a short, well-written history section about the GERRY brand, and it includes a picture of Gerry and his wife Ann. 2007 NEWS: the modern GERRY Website recently brings up this sad message: "gerryinternational.com expired on 10/27/2007 and is pending renewal or deletion." (Network Solutions)....Is the GERRY brand now facing its final extinction? December 29, 2007 Update: it appears true that this GERRY under Amerex has now become extinct. The Gerry website has now become only a "portal" site, and provides numerous links to all kinds of services and companies, including, ironically, a link for down vests that leads one to, of all places, REI. 2008 NEWS: GERRY has been revived in Europe! It's based in Sweden, and has begun distributing a small-line-up of classic down garments. I've communicated with the owner. From another correspondent, I know that one of their outlets is in Berlin....They are using the later-era version of the logo, such as you can see above on the "How to Keep Warm" booklet....2010, November. This new GERRY company is now also kaput. 2013 GERRY news: GERRY is once again being revived, this time by a company based in New York City named Studio Ray. I have been in contact with them, and will have more news after I have checked them out thoroughly. 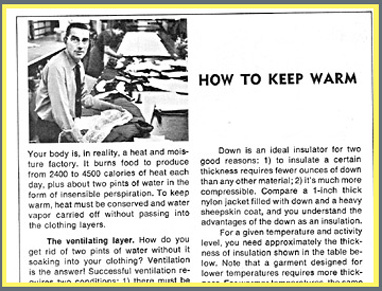 Apparently at this time they have produced a few models of down jackets under the name GERRY OUTDOORS; those are marketed mainly through outlets like Sports Authority and Dillards. The new company also has a nice Facebook page. Note: I still have not been able to personally review any of their products, so cannot comment on their design and quality. Main Page: Essays and pictures about the Pioneers of the Outdoor Gear Revolution, 1935 to the Present, 45+ pages, six books published, and ever-expanding! Frostline Kits, the Founder of Frostline was an early employee/collaborator of Gerry Cunningham!